Awesome, juggy face climbing and stemming up a fearsome looking chimney system, Tunnel Vision is great fun and a good introduction to easy chimney climbing. However, as with most chimney climbs, there is poor protection for long stretches, including the crux 5.7 pitch. The tunnel itself is a blast on polished rock which will make you nervous, but never gets too hard. Several variations including a new one on the crux pitch offer even more variety on an already sweet climb. Which SuperTopo guidebooks include a topo for Tunnel Vision? FA: Joe Herbst, Randal Grandstaff, 1974. 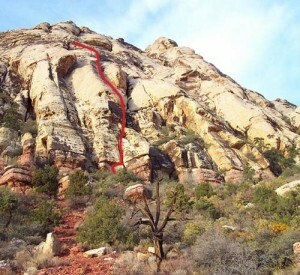 Tunnel Vision marked the beginning of an age of expansion in Red Rocks climbing. The previous year saw ascents of both the Rainbow Wall and Velvet Wall. Both climbs were achieved by parties that included Joe Herbst. Several years earlier, Joe adopted the clean climbing ethic while working with the influential Doug Robinson. As a leading figure in those days at Red Rocks, Joe passed on this influence to the next wave of climbers. One impressionable youth who really picked up the ball and ran with it was young Randal Grandstaff. Just 16 years old at the time of the Tunnel Vision climb, Randal was at the beginning of a productive climbing career. His resume would soon include numerous significant Red Rocks ascents, many big Yosemite routes, and even extended to an Everest expedition. Perhaps his greatest achievement was the establishment of the Sky’s the Limit guide service. Randal’s efforts put guiding on the map in Las Vegas and allowed him to make a living doing what he loved.